This first generation Corvair has been abused by many folks, starting with a young lawyer turning politician who needed to make a name for himself and then by a plasma cutter wielding craftsman and finally by a tree. 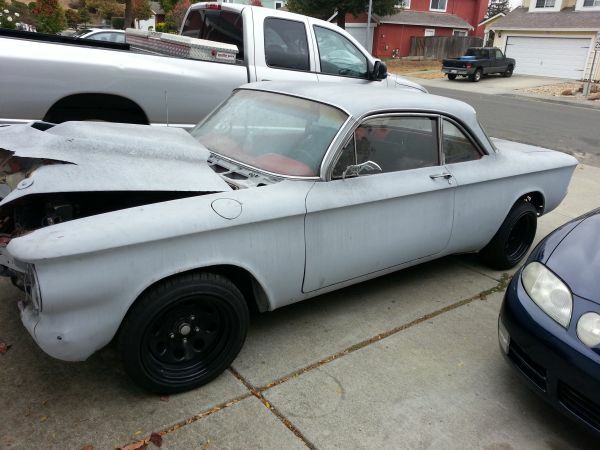 This 1961 Chevy Corvair has a 350 V8 mounted in the front and is for sale in Los Angeles, CA for $3500 obo. 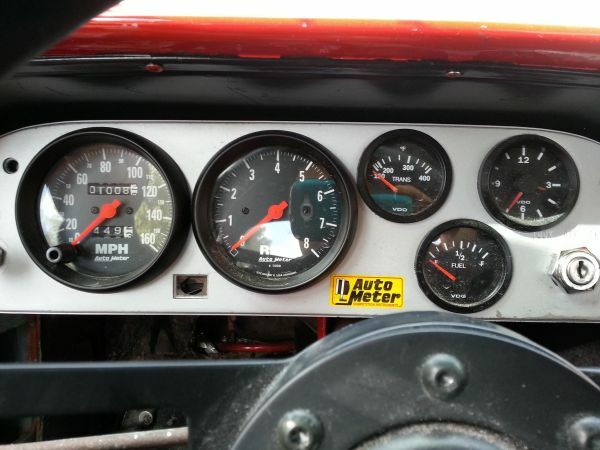 First, what is clear from the photos is that the early 60s brakes aren't up to task with all that power. It has made love to a large object, perhaps an angry Sasquatch or a festive fir tree, causing major damage to what looks to be a steel hood with an added fiberglass scoop which now seems to be delaminating due to the shunt. 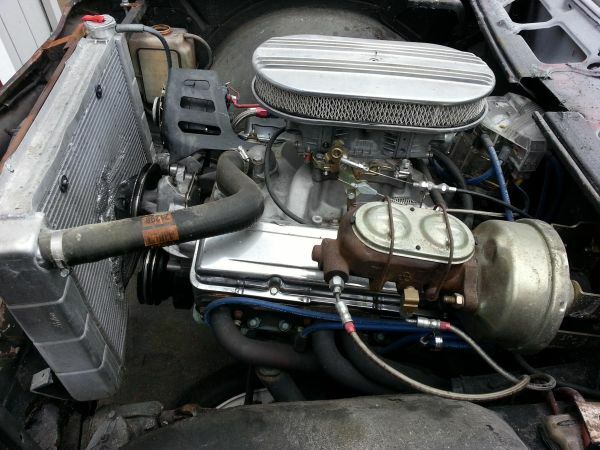 The seller avoids this detail and only notes in his text that the radiator has a dent and needs water...but judging by what we can see in the one exterior picture, this thing has had a serious nose job. And there it is - the radiator was pushed back into the engine ramming the fan-less upper and lower pulleys into the radiator (the two black round parts are zip-tie legs from a pusher mounted aftermarket electric fan). The bottom pulley has chunks taken from its v-belt grooves and the radiator is toast. This car is going to need some serious love before the 400+ horsepower 350 cubic inch V8 is able to ram the car into another stationary object. Part of the braking crashing issue may be related to the use of flexible lines directly from the master cylinder instead of the much less likely to expand and reduce braking power hardline. We really wish we could drum up more enthusiasm for this car since its price is so low, but it is a bondo colored wreck that needs at least a complete interior and exterior remodel, and probably has untold mechanical issues to boot. The major question revolves around the method of mounting that small block in a compartment that was never designed to house an engine. But when finished, it could be a wickedly fast and fun cruiser..with a back seat too! Just make sure your tetanus shot is up-to-date before inspecting this car and be prepared for some work when you get it home. Great catch on the braided brake lines! (He must ride motorcycles) Best line from his craigslist ad.. "i have over 15k invested in this car.. its sounds awesome. if its not gone by the time i get my taxes back ill just keep it and put more money into .. "
The pride and determination from which great epitaphs for Darwin Award winners are eventually pulled. I'm a huge fan of the "if this doesn't sell, I'm gonna put more money into it" threat. In the long list of 'how to douchify your craigslist ad' it is second only to BYOR pricing. (bring your own rimz). ~ huge thumbsUP! @ OFTF. nail'dit! what would he take to keep it, shut t!f! up and go away??? "Radiator has a dent and needs water"
~ a new radiator is going to be $3-400 on the low end. salvage value of that scrap unit ought to be about 20 bucks.